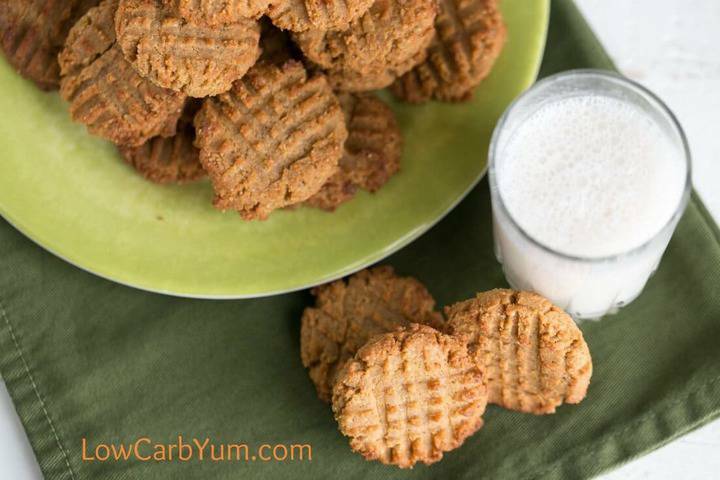 Fantastic low carb peanut butter cookies made with gluten free coconut flour. 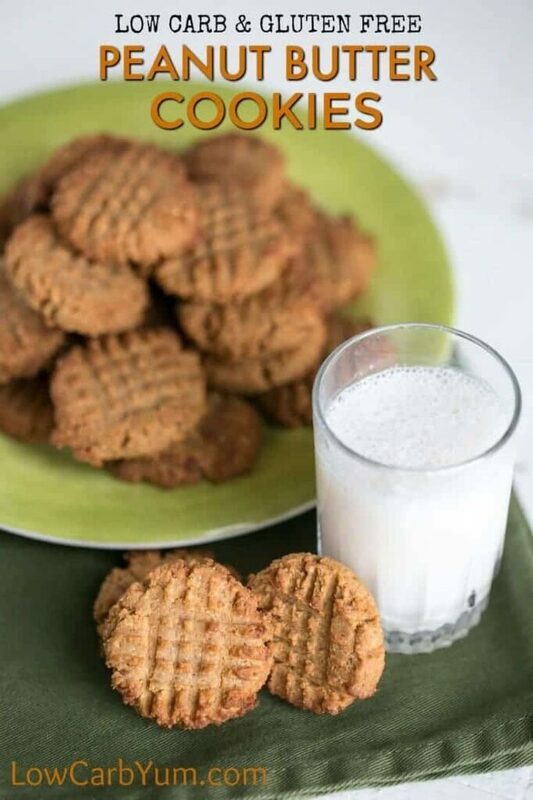 Enjoy them as a treat with a cup of almond or coconut milk. Like many of you, I’ve given the flourless cookies a try. Those recipes typically have three basic ingredients: nut butter, egg, and sweetener. Unfortunately, the texture of the the flourless cookie just isn’t the same as one made with flour. So, I decided to experiment with adding coconut flour to the basic recipe. Most of my regular cookie recipes also include butter so I added some of that too. If you follow a dairy-free diet, you can always use coconut oil instead. 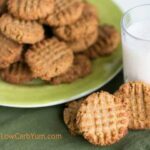 After a couple tries, I came up with these low carb peanut butter cookies. The addition of the coconut flour really improves the texture. When I first made the cookies, I used all Swerve. However, the cooling taste was definitely present. I recommend reducing the Swerve and adding in stevia concentrate. The sweetener blend makes the cooling effect of erythritol unnoticeable. 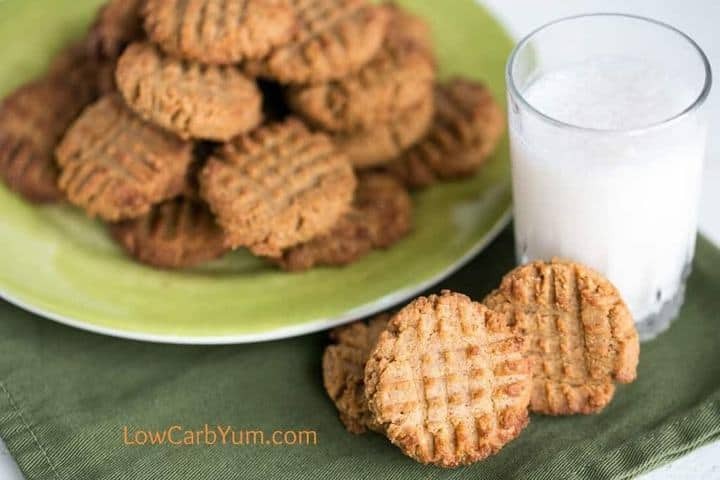 Depending on how sweet you want these low carb peanut butter cookies, you can add anywhere from 1/2 to 3/4 cup sugar equivalent. The amount of sweetener I used in the recipe is closer to 1/2 cup of sugar. Although I thought the coconut flour amount was just right, you may want to adjust it slightly to get the texture you prefer. I like the cookie crisp on the outside and a bit softer in the middle. Coconut flour does vary by brand. So, you may need more or less of it. It’s best to tweak the sweetener and coconut flour until you get something that works best for your ingredients. I wouldn’t change the amounts of the other ingredients. However, you may need to adjust the salt if your peanut butter is salted. I always buy unsweetened peanut butter with no added salt. The batter does not spread much in the oven. 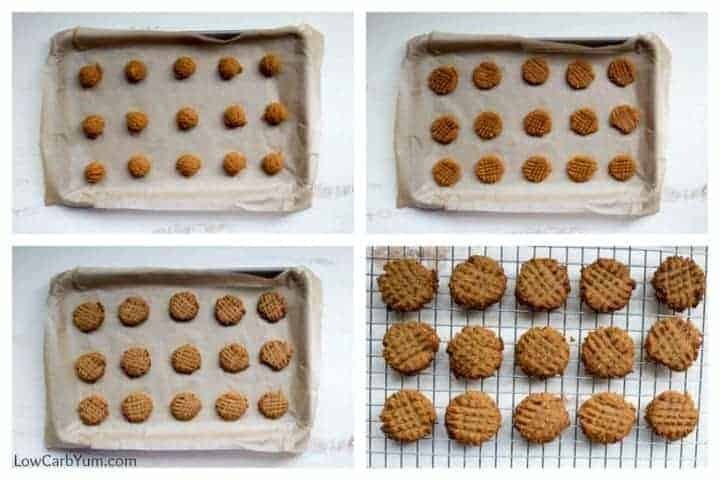 So, if you want thinner cookies, you’ll need to flatten them very thin before baking. You may want to press the balls down flat before criss-crossing with the fork. 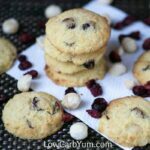 Overall, I was very happen with how these coconut flour based gluten free cookies came out. And, there’s enough peanut butter to cover any coconut taste. 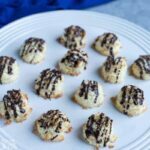 To modify this recipe into a flourless cookie, you’d need to omit the coconut flour, butter, and egg. And, the sweetener would likely need to be reduced to accommodate. 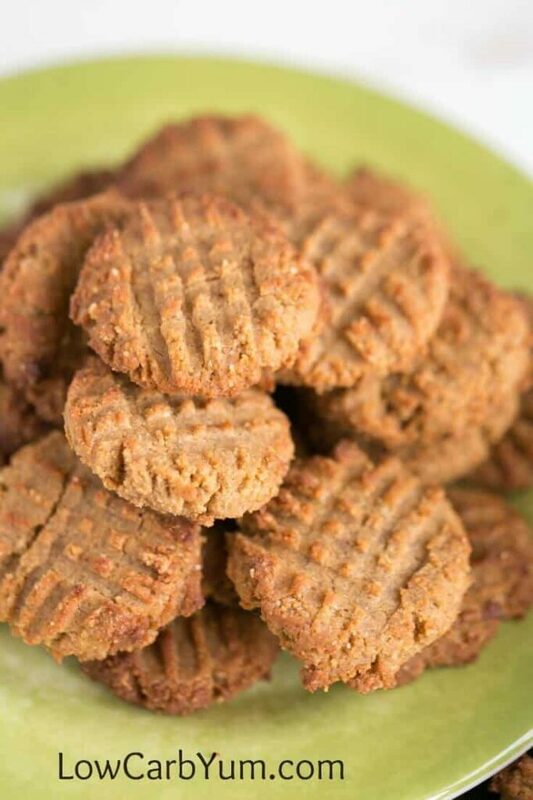 But, I was looking for low carb peanut butter cookies that had the texture of flour based ones. The coconut flour is needed to achieve that. I’m wonder how these cookies would work out as peanut butter blossoms. 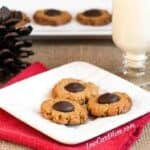 I do have this recipe that tops of a peanut butter flavored cookie with homemade chocolate kisses. I also have a thumbprint cookie filled with sugar free chocolate chips. All of these cookie recipes would be perfect for holiday treats! I still haven’t decided which cookies I will bake for the holidays. 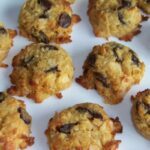 Most low carb cookie dough can be made ahead and frozen. Have you already planned out your low carb holiday treats? I’m looking to make easy ones this year. 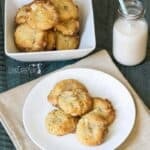 I hope you give this coconut flour based recipe a try. If you’ve also made flourless cookies, I’d love to know which you prefer. Drop scoops or balls of dough onto parchment paper lined baking pans. 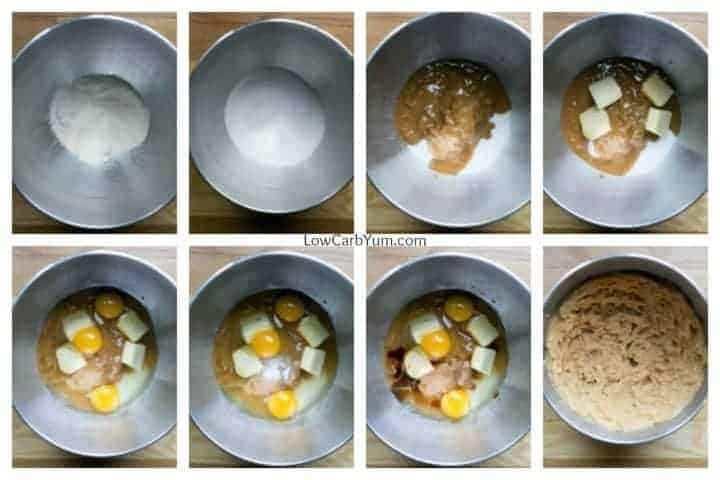 Flatten each dough ball by making criss-cross mark with fork. For flatter cookies, press down first with fingers before making the fork marks. Bake at 350°F for 12-15 minutes or until edges of cookies have browned. Coconut flour can be adjusted to get desired texture. More will result in more cake-like and less will be more dense. You'll need about 1/2 cup sugar equivalent sweetener to replace the Swerve and stevia. Each cookie contains about 0.8g erythritol. 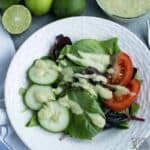 Get a FREE 3-Day Keto Meal Plan or join the Low Carb Yum Facebook Group for help with recipes and weight loss support! Nutritional information for the recipe is provided as a courtesy and is approximate only. We cannot guarantee the accuracy of the nutritional information given for any recipe on this site. Erythritol carbs are not included in carb counts as it has been shown not to impact blood sugar. Net carbs are the total carbs minus fiber. Tried this recipe?Mention @lowcarbyum or tag #lowcarbyum! Unauthorized use and/or duplication of this material without written permission from this site’s owner, Lisa MarcAurele, is strictly prohibited unless for personal offline purposes. 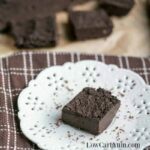 Excerpts, single photos, and links may be used, provided that full and clear credit is given to LowCarbYum.com with appropriate and specific link back to the original content. 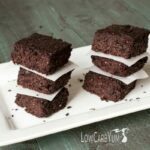 Lisa has been creating low carb recipes for herself and sharing them with others since 2010. 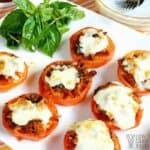 She loves to experiment in the kitchen and find new ways to create low sugar foods that taste like high carb favorites!